​are the perfect places to relax, play, and spend the day. Roscoe Roof Park is located in the heart of Carlisle, nestled comfortably amongst quiet housing subdivisions and situated next to one of the village's many CSX railroad tracks. ​The largest of the village's park system, Roscoe Roof offers a variety of recreational opportunities for Carlisle residents. Ample parking is located at the main entrance with additional parking available at the rear entrance. Roscoe Roof Park is open year-round, from dawn until dusk. ​Restroom facilities are available seasonally, open to residents from dawn until dusk (locked overnight). What does the park have to offer? There are three picnic shelters located throughout the park (two large and one small) - each with picnic tables and trash receptacles. Individuals may reserve the two large shelters for four hours for $30, or for the entire day for $60. The two large shelters have access to electrical outlets that may be used with the rental of the shelters. Up to four hours of electrical access is included with the reservation fee. Additional hours of access may be acquired for an additional fee of $6 per hour. ​Two separate playground areas are located in the park: one for older children in the western section of the park, and a toddler play area directly next to it. Both playground areas are open daily during daylight hours for general public use. Each entrance leads directly to a half-mile walking/jogging trail (the "Crazy Eight" path), as well as the Memorial Tree path. Both trails take visitors past all of the park's facilities. Roscoe Roof Park also has restroom facilities and water fountains near the main entrance of the park. Located in the northeastern section of Carlisle, this small neighborhood park offers a sampling of various playground equipment, including a slide, swing set, parallel bars, and basketball court. The park also has one shelter with picnic table. Main entrance — off of Walnut Ave. Parking is located at the main entrance. Cook Park is open year-round, from dawn until dusk. Cook Park offers a sampling of various playground equipment, with some recent additions including a slide, swing set, and basketball court. The park also has one shelter with picnic table that is available on a first-come, first-served basis. No rental form is required. ​Lions Park is located on the southeastern side of the municipality limits. The park has various pieces of playground equipment what appeal to both younger and older children, including a slide, swing sets, and a climber. The highlight of the park is the baseball field, complete with a full backstop. Lions Park is open year-round, from dawn until dusk. Lions Park has various pieces of playground equipment, including a slide, swing sets, and climber that appeal to both younger and older children. The highlight of the park is the baseball field, complete with a full backstop. Located at 390 Central Avenue, the Tapscott Church is one of the oldest buildings in Carlisle. Built in the early 1900s, the church was used by the some of the earliest residents in the Carlisle area. In 2003, the property was donated to the town by the members of the Primitive Baptist Church, in hopes that its rich history could be preserved for future generations. The municipality oversees the maintenance of the building and cemetery. To view further details concerning long-term development of the Tapscott Community Center, visit the Village Park Master Plan. Use this form to rent a park shelter at Roscoe Roof Park. The parks master plan guides all future improvements to Carlisle's three parks and the Tapscott building. 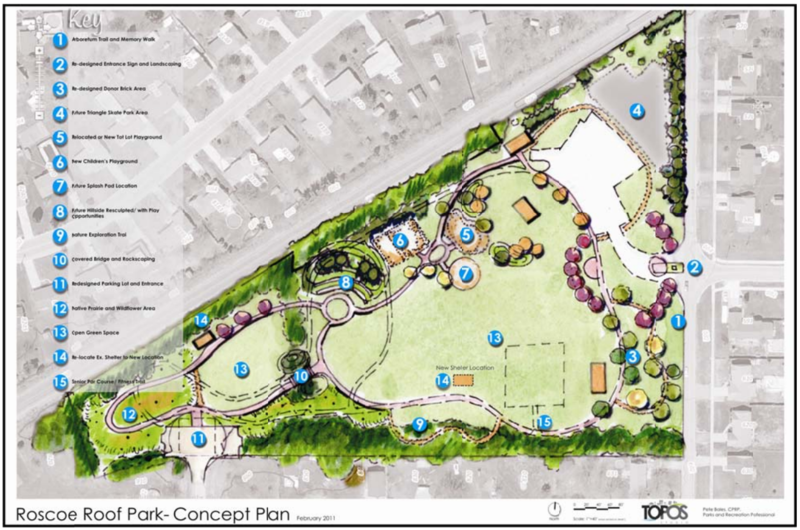 The concept plan is an artist rendering of proposed improvements to the park.